Mike Greene - mgreene@shawmedia.com Huntley High School senior Anthony Kennedy speaks with Terri Ward (cq), owner of Tropical Smoothie Cafe, during a mock interview Tuesday, April 17, 2012 at the Huntley District 158 office in Algonquin. The down economy has placed a greater emphasis on being well prepared for the job market. Mike Greene - mgreene@shawmedia.com Huntley High School senior Karli Cervantes (cq) listens to Joel Bosman, District 158 campus supervisor, during a mock interview Tuesday, April 17, 2012 at the Huntley District 158 office in Algonquin. The down economy has placed a greater emphasis on being well prepared for the job market. Mike Greene - mgreene@shawmedia.com John Voelz, physical therapist at Northwest Senior Wellness, speaks with Huntley High School senior Juli Domingo during a mock interview Tuesday, April 17, 2012 at the Huntley District 158 office in Algonquin. Students from Huntley High School's co-op program interviewed with over 20 individuals from local business to gain experience with the hiring process. 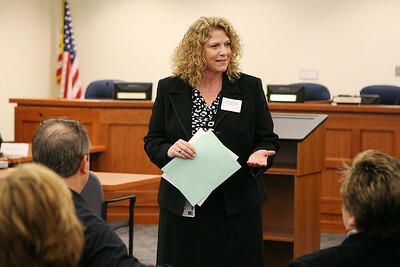 Mike Greene - mgreene@shawmedia.com Mary Graft, director of the Cooperative Education Program at Huntley High School, speaks with individuals from local businesses prior to the start of mock interviews Tuesday, April 17, 2012 at the Huntley District 158 office in Algonquin. Graft spoke with the group about what she wanted to see from the event. John Voelz, physical therapist at Northwest Senior Wellness, speaks with Huntley High School senior Juli Domingo during a mock interview Tuesday, April 17, 2012 at the Huntley District 158 office in Algonquin. Students from Huntley High School's co-op program interviewed with over 20 individuals from local business to gain experience with the hiring process.